Spend a short time on the treadmill for difficult sessions and do long sessions for less-intense workouts. Vary the duration of your treadmill routine to continue to improve your fitness. If you have a treadmill at home, you further reduce your chances of skipping your treadmill routine because you are removing the travel and time barriers of going to your local gym. The type of workout you do on the treadmill determines how long you will be on the treadmill. Take 10 minutes to warm up and 10 minutes to cool down for all types of treadmill workouts. If you do a high-intensity workout, it should only last for 20 minutes, in addition to your warm-up and cool-down. If you do a low- to moderately intense endurance or weight-loss workout, you will spend 60 to 90 minutes on your actual session. For a workout to maintain your health, you need to do a total of 30 minutes of moderately intense treadmill exercise. If you only have a few minutes to get on the treadmill, you can do a vigorously intense treadmill workout for 20 minutes instead of a low- to moderately intense workout for 60 minutes. You burn slightly more calories with a short, difficult workout compared to a longer, easier workout. You also raise the tolerance level of your muscles to lactic acid when you do short, intense treadmill routines. Performing short, highly intense exercise on the treadmill increases the amount of enzymes which break down stored body fat. 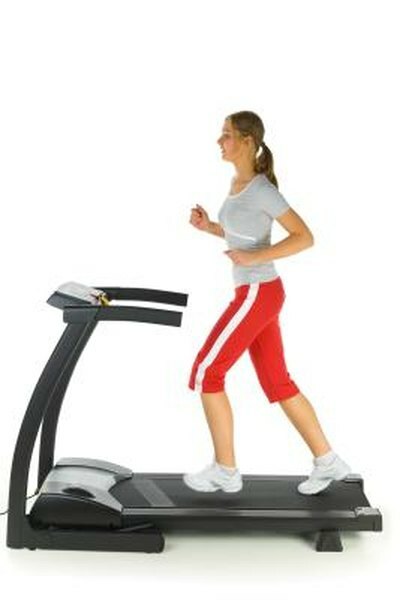 Completing long, easier treadmill sessions trains your body to utilize stored body fat during exercise. By varying the time and intensity of your treadmill workout, you increase the density of capillaries in your working muscles, increasing blood flow. You also increase the capacity of your cells to use carbohydrates, fats and oxygen to fuel your workout. If you do the same treadmill routine every session, your body will adapt to your training and your fitness performance will level off. Instead of always running for 60 minutes, five days a week, substitute two long sessions with two high-intensity interval sessions -- such as sprinting for 30 seconds and walking for 90 seconds -- for 20 total minutes. Walking, running or doing a walk-and-run combination workout on a treadmill also eases the impact on your joints. You do not have to spend hours on your treadmill every day to lose weight or improve your fitness. If you vary the intensity of your treadmill session by changing the speed and the incline, you can modify the length of time you need to complete a treadmill routine. You will also reap the same health benefits if you do three 10-minute treadmill walks or runs instead of a single 30-minute session.